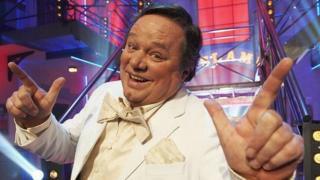 Veteran entertainer Ted Robbins has been treated for smoke inhalation after a fire broke out in a tumble dryer and "completely gutted" part of his home. The blaze started in the cellar of the Phoenix Nights star's house in Rossendale, Lancashire, on Monday. The comedian, who was resuscitated after collapsing on stage during a live show at Manchester Arena in 2015, was given oxygen by fire crews. Robbins, 63, said the smoke had spread "everywhere" within minutes. The Liverpool-born actor and BBC Radio Lancashire presenter, said he had noticed an "acrid smell" at about 14:00 BST, and "couldn't breathe. My eyes were watering". "It happened so quickly. It was billowing out. Within three minutes the place was full of smoke," he said. Nobody was harmed but Robbins said his wife Judith's underwear perished in the flames. "She hasn't got any knickers. It burnt the lot," he said, adding that a utility room and bathroom were left "completely gutted" by thick smoke. "We're hugely lucky to get out and stay out. I covered the tumble dryer with a wet towel. It was the last thing I expected because it was plugged in but it wasn't on," he continued. "I'm so glad no-one was hurt and it wasn't at night." Robbins, who also presented children's talent show The Slammer, thanked Lancashire Fire and Rescue Service for their speedy response and warned people to check the safety of their appliances. When firefighters asked if he had breathed in smoke, Robbins said he joked with them: "Not since the fourth form at school behind the bike sheds." But he added: "You know something is serious when there is no banter."